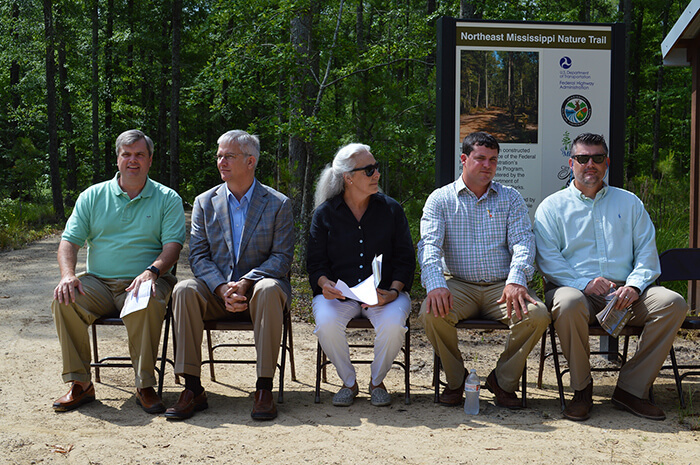 I was honored to have the opportunity to attend the grand opening ceremony at the Northeast Mississippi Nature Trail in Amory, MS, on the morning of May 19th. It was a great opportunity to see the completed trail and to meet with all of the many people and organizations involved in the project. James Cummins of Wildlife Mississippi gave the introductory remarks for the grand opening. Other speakers included Martha Dalrymple of the Dalrymple Family Foundation; City of Amory’s Mayor Brad Blalock; Julian Carroll of Senator Roger Wicker’s Office; City of Amory Parks and Recreation Director Rory Thornton; Transportation Commissioner Mike Tagert; and Skip Skaggs, Executive Director of the North Mississippi Industrial Development Association. 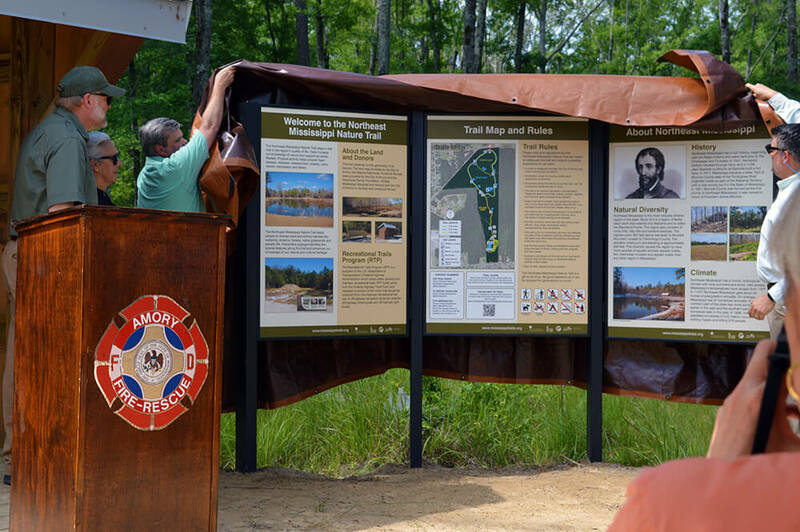 We worked with Wildlife Mississippi and the City of Amory to design 50 interpretive signs that cover habitat, wildlife species, weather, Native Americans, historical figures, and more. The 1.5 miles of dirt trails traverse through wetlands, forests, grasslands, and over streams and ponds. Along the path, the various interpretive signs provide educational information pertinent to that particular location along the trail. A large boardwalk crosses over a waterway for a good view of the habitat. Benches and pavilions line the trail, providing resting spots for those on the trail. This is a great project that provides a place for people to exercise, recreate, and learn about North Mississippi all at the same time. Click on a photo below to see a full-size image. The trail was constructed with the assistance of the Federal Highway Administration’s Recreational Trails Program, which is administered by the Mississippi Department of Wildlife, Fisheries, and Parks. Matching Funds were provided by the City of Amory, the Dalrymple Family Foundation, and Wildlife Mississippi.